I, Daniel Blake is a 2016 drama film directed by Ken Loach and written by longtime collaborator Paul Laverty. It stars Dave Johns as Daniel Blake, who is denied employment and support allowance despite his doctor finding him unfit to work. Hayley Squires co-stars as Katie, a struggling single mother whom Daniel befriends. The film won the Palme d'Or at the 2016 Cannes Film Festival, the Prix du public at the 2016 Locarno International Film Festival, and the 2017 BAFTA for Outstanding British Film. Widower Daniel Blake, a 59-year-old joiner from Newcastle, has had a heart attack. Though his cardiologist has not allowed him to return to work, Daniel is deemed fit to do so after a work capability assessment and denied employment and support allowance. He is frustrated to learn that his doctor was not contacted about the decision, and applies for an appeal, a process he finds difficult because he must complete forms online and is not computer literate. Daniel befriends single mother Katie after she is sanctioned for arriving late for a Jobcentre appointment. Katie and her children have just moved to Newcastle from a London homeless shelter, as there is no affordable accommodation in London. Daniel helps the family by repairing objects, teaching them how to heat rooms without electricity, and crafting wooden toys for the children. During a visit to a food bank, Katie is overcome by hunger and breaks down. After she is caught shoplifting at a supermarket, a security guard offers her work as a prostitute. Daniel surprises her at the brothel, where he begs her to give up the job, but she tearfully insists she has no other way to feed her children. As a condition for receiving jobseeker's allowance, Daniel must keep looking for work. He refuses a job at a garden centre because his doctor will not allow him to work yet. When Daniel's work coach tells him he must work harder to find a job or be sanctioned, Daniel spraypaints "I, Daniel Blake, demand my appeal date before I starve" on the building. He earns the support of passersby, including other benefits claimants, but is arrested and cautioned by the police. Daniel sells most of his belongings and becomes withdrawn. On the day of Daniel's appeal, Katie accompanies him to court. A welfare adviser tells Daniel that his case looks sound. On glimpsing the judge and doctor who will decide his case, Daniel becomes anxious and visits the lavatory, where he suffers a heart attack and dies. At his public health funeral, Katie reads the eulogy, including the speech Daniel had intended to read at his appeal. The speech describes his feelings about how the welfare system failed him by treating him like a dog instead of a man proud to have paid his dues to society. Principal photography began in October 2015 in Newcastle upon Tyne and the surrounding area. The film was produced by Rebecca O'Brien for Sixteen Films, Why Not Productions and Wild Bunch with the support of the British Film Institute and BBC Films. I, Daniel Blake became Loach's biggest success at the UK box office. On review aggregator website Rotten Tomatoes, the film has an approval rating of 93%, based on 168 reviews, with an average rating of 8/10. The site's consensus reads: "I, Daniel Blake marks yet another well-told chapter in director Ken Loach's powerfully populist filmography." On Metacritic the film has a score of 78 out of 100 score, based on 31 critics, indicating "generally favourable reviews". Former Conservative Work and Pensions Secretary Iain Duncan Smith said I, Daniel Blake was unfair, criticising its portrayal of Jobcentre staff, saying: "This idea that everybody is out to crunch you, I think it has really hurt Jobcentre staff who don't see themselves as that." Producer Rebecca O'Brien responded that Smith "is living in cloud cuckoo land". On an episode of BBC's topical debate programme Question Time broadcast on 27 October 2016, which featured Loach as a panellist, Business Secretary Greg Clark described the film as "fictional", saying: "It's a difficult job administering a benefits system ... Department of Work and Pensions staff have to make incredibly difficult decisions and I think they should have our support in making those decisions." Loach responded by criticising the pressure that DWP staff are placed under. Leader of the Labour Party, Jeremy Corbyn, appeared at the film's London premiere and praised the film on his Facebook page. During Prime Minister's Questions on 2 November 2016, he criticised the unfairness of the welfare system and advised Prime Minister Theresa May to watch the film. ^ "I, Daniel Blake (15)". British Board of Film Classification. 18 August 2016. Retrieved 19 August 2016. ^ "I, Daniel Blake (2017)". Box Office Mojo. Retrieved 13 May 2018. ^ Lee, Benjamin (22 May 2016). "Cannes 2016: Ken Loach's I, Daniel Blake wins the Palme d'Or - live!". The Guardian. Retrieved 22 May 2016. ^ "Cannes Film Festival Winners: Palme d'Or To Ken Loach's 'I, Daniel Blake'". Deadline Hollywood. Retrieved 22 May 2016. ^ a b "Palmarès 2016". Locarno. ^ "2017 Film Outstanding British Film". BAFTA. Retrieved 21 August 2017. ^ Hodgson, Barbara (8 November 2015). "Award-winning director Ken Loach takes to the streets of Newcastle to shoot his latest feature film". Evening Chronicle. Retrieved 25 May 2016. ^ Solutions, Starlight. "People :: Rebecca O'Brien". www.sixteenfilms.co.uk. Archived from the original on 18 May 2016. Retrieved 26 May 2016. ^ Gleiberman, Owen (12 May 2016). "Cannes Film Review: 'I, Daniel Blake'". Variety. Retrieved 25 May 2016. ^ "'I, Daniel Blake' Is Ken Loach's Most Successful UK Release Ever". The Film Magazine. 24 October 2016. ^ Gant, Charles (25 October 2016). "I, Daniel Blake scores impressive result at UK box office as Trolls takes top spot". The Guardian. 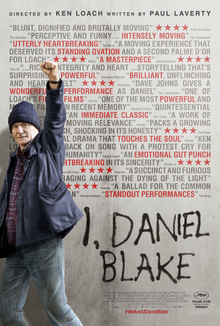 ^ a b "I, Daniel Blake". Rotten Tomatoes. Retrieved 17 May 2018. ^ "I, Daniel Blake reviews". Metacritic. Retrieved 20 July 2017. ^ "Iain Duncan Smith's predictable response after watching I, Daniel Blake". The Independent. 28 October 2016. ^ "I, Daniel Blake producer responds to Toby Young, Iain Duncan Smith". inews.co.uk. 28 October 2016. ^ a b "Ken Loach and minister Greg Clark clash over 'fictional' I, Daniel Blake on Question Time". ^ Kelly, Mike (19 October 2016). "Jeremy Corbyn urges film fans to go see Tyneside-set I, Daniel Blake". ^ "PMQs: Corbyn tells May to watch I Daniel Blake film". www.bbc.co.uk. 2 November 2016. ^ Ritman, Alex (9 January 2017). "BAFTA Awards: 'La La Land' Leads Nominations". The Hollywood Reporter. Retrieved 10 January 2017. ^ Hipes, Patrick (12 February 2017). "BAFTA Awards Winners List (LIVE)". Deadline Hollywood. Retrieved 12 February 2017. ^ Evans, Alan (1 November 2016). "I, Daniel Blake leads British independent film award nominations". The Guardian. Retrieved 1 November 2016. ^ "Cannes 2016". The Guardian. Retrieved 22 May 2016. ^ "PALMARÈS 2017 - 42 ÈME CÉRÉMONIE DES CÉSAR". Académie des Arts et Techniques du Cinéma. Retrieved 24 February 2017. ^ "AWARD WINNERS FOR 39th DENVER FILM FESTIVAL - Denver Film Festival". Denver Film Festival. Archived from the original on 29 November 2016. Retrieved 5 December 2016. ^ Evans, Alan (7 November 2016). "Toni Erdmann leads nominations at European film awards". The Guardian. Retrieved 11 December 2016. ^ Norum, Ben (9 December 2016). "Evening Standard British Film Awards: Kate Beckinsale and Hugh Grant Crowned". London Evening Standard. Retrieved 9 December 2016. ^ Degré, Michaël (11 January 2018). "Magrittes 2018: vers un match Streker-Belvaux?". L'Avenir (in French). Retrieved 16 January 2018. ^ "'Moonlight' Named Best Picture by New York Film Critics Online Association". The Hollywood Reporter. 11 December 2016. Retrieved 11 December 2016. ^ Rosser, Michael (19 August 2016). "San Sebastian: 'I, Daniel Blake', 'Fire At Sea' in Pearls line-up". Screen Daily. Retrieved 11 December 2016. ^ Ramsay, Angela. "Ken Loach's I, DANIEL BLAKE Wins Stockholm Audience Award at Stockholm Film Fest". Vimooz.com. Retrieved 11 December 2016.